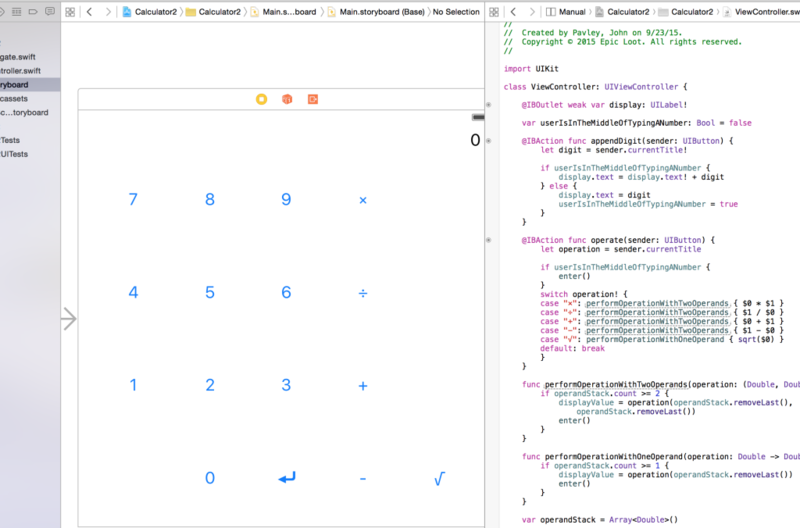 Look at that beautiful Apple Swift code on the right with closures and shorthand argument names! Make’s me smile every time! I’m enjoying the Stanford University class CS193P: Developing iOS 8 Applications with Swift. It’s free on iTunes U and the instructor Paul Hegarty knows his stuff. He’s a great explainer. I like how first he writes some code in a naive way and then fools around with it, getting it to work and then reworking it like a sculptor with clay. That’s how real programmers work. We write a rough draft of the code, make sure we understand it and then “refactor” it until we’re no longer embarrassed to share it on GitHub. But even though the class was recorded in 2014 and updated in June of 2015 it’s aging rapidly. We’re already working with Xcode 7 and iOS 9. And all the little minor changes and improvements are adding up. Unfortunately this code no longer compiles. There is an explanation on Stack Overflow (if you can find it). But it’s not really clear as there are a couple of solutions. Perhaps the best solution, like so much on the human side of computer programming, is a matter of taste. Because Swift is smart about classes written in Objective-C that you are subclassing from, it forces those subclasses, in this case UIViewController, to obey Objective-C’s limitations. One of those limitation was not allowing polymorphism for methods with the same name but different arguments.